Getting a good location and adequate space is just half the work. You cannot operate smoothly without the right furniture. Getting office furniture is tricky as you to consider what will appeal to your visitors and employees. The search for good furniture is now easier as you just need to access Brighton Series products from Mayline office furniture. The furniture in your office is important as the office space itself. As you do your best to get an office at the best location and with enough space for your work needs, you should also get suitable office furniture. Brighton collection has the right design of furniture suitable for all your office needs and employees. Brighton Series products has CARB compliant office desks that you get at the right price. In addition, your furniture has limited lifetime warranty. There are various desks on sale with all having adequate space for holding your computer accessories, documents and other stationery. The desks have a durable surface that is 1″ thick. They also got arched modesty panels that give it a different look because of they are unique. Everyone wants his office to look different from others. The unique look of Brighton helps you to achieve the purpose, and it saves you the effort of searching for exclusive desks from different sellers. Office décor is another crucial thing to consider when purchasing your office furniture. 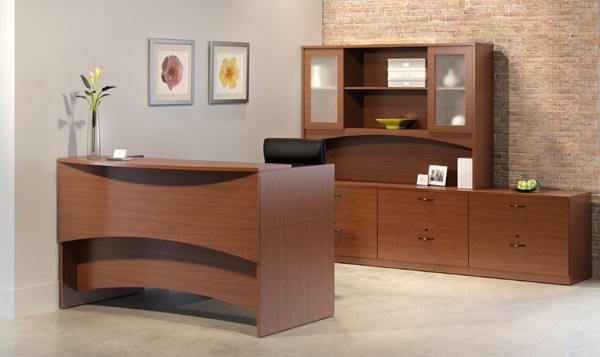 This series is the opportunity to find office furniture matching your office décor and brand since its products has a variety of finishes like veneer, cherry or mocha. Brighton series helps you to utilize all the available space in your office as it has office desks and storage furniture of different sizes. You just need to choose the right one(s) for your office. It also has a variety of credenzas and desks on which you may add mobile Box-Box file, File-File or Box-File-suspended pedestals. All the file drawers accommodate legal size or letter size filing when it is done side to side and front to back respectively. Bridges, desks and credenzas are both right and left handed hence simple to arrange or rearrange. Brighton series IS a good choice for furniture that gives high value to your office.